Wedding Venues South Ayrshire ARE YOU A SUPPLIER? Guide to wedding venues in South Ayrshire: in our listings you will find the best venues to celebrate weddings and other events like anniversaries, birthdays, christenings and other unforgettable special occasions. You can take a look at prices and wedding packages in addition to the best offers in wedding receptions in South Ayrshire. What could be better than getting married in the birthplace of Robert Burns? South Ayrshire's stunning stretches of sandy beach, rolling hills, and adorable market towns add to the region's historic celebrity. There's plenty for your wedding guests to do, see, and explore: festivals abound throughout the year, and there are lovely woodland walking trails for those who can't live without a spot of fresh air. 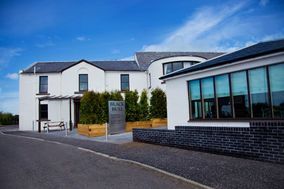 South Ayrshire is definitely a world-class tourist destination, which means you won't have to worry about where your out-of-town guests will lodge and dine. 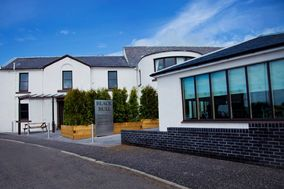 The amenities here for brides and grooms and their wedding guests are manifold, and there are South Ayrshire wedding venues for every taste and budget. Planning a wedding here is as easy as getting here — which guests can do by rail, air, sea, or road — though if you don't find exactly what you're looking for, you can easily widen your venue and vendor search into Glasgow or Edinburgh. 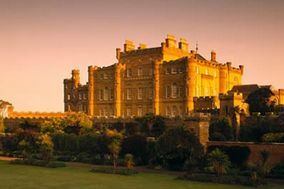 South Ayrshire wedding venues range from historic sites to modern hotels to working family farms. There are all-inclusive venues in stunning spa hotels with amazing views of the surrounding countryside, country mansions with picture perfect gardens, and castles upon castles where you can feel like royalty for the day. You can even make your vows and then celebrate them while overlooking the sea in one of the many waterfront wedding venues in South Ayrshire. Tip: A wedding budget planner can help you choose between venues and vendors. If you know how much you can comfortably spend, you can focus your attention on providers that fit into your budget. Think about how much your choice of wedding venue will influence your celebration. The look and feel of your entire wedding will be determined in part by the South Ayrshire wedding venue you choose. That means that finding a venue you love will be one of the most important items on your wedding to-do list! Getting started can be the hardest part, so do yourself a favour and begin browsing South Ayrshire wedding venues online ASAP. Make a list of the venues that have the vibe you're looking for and are large enough to host your expected wedding guest list. Your next step will be finding out which of these are available on your preferred wedding date and scheduling guided tours of those that are. Why not just book one now? Because booking your wedding venue based on photos alone is almost always a bad idea. Some South Ayrshire wedding venues look very different in person, some won't be able to accommodate guests with additional needs, and some just won't feel right. Finding the venue that does have what you're looking for is a matter of walking through it and seeing it first-hand. You'll benefit from the opportunity to ask lots of questions in person during your tour, since your guide's answers will provide loads of insight into how the venue handles weddings. Always ask about prices, what packages include, the cancellation policy, and what deposits are required to book. You might also ask about whether you can design your own menu, how many vehicles the car park can accommodate, how they'll handle bad weather if your wedding will be outdoors, and if you can use outside vendors for your catering and decor. Make sure your guide (usually the wedding venue coordinator or sales manager) gives you plenty of time to tour the entire property and answers all your questions. The more time you spend in a venue, the more confident you'll be that it's the right one! Planning a wedding will always be a little stressful, but it's less so when you have help! WeddingWire has all the tools you need to plan a picture perfect Big Day, from an easy to use table planner to our wedding dress catalogue.